TROPHY GIRL: Georgia Hall celebrates a wonderful Open victory. ENGLAND’S Georgia Hall hopes she can encourage more young girls to take up golf after winning the Women’s British Open at Royal Lytham & St Annes. The 22 year-old is only the third British winner since the event became a major championship in 2001. Hall, who won by two shots at 17 under par, also hopes to help attract new sponsors to the Ladies European Tour. “I want to be a good role model for young girls in Britain and hopefully I can encourage a lot of them to take up the game,” she said. Victory meant the 2013 British ladies’ amateur champion emulated compatriot Karen Stupples (2004) and Scot Catriona Matthew (2009), the other two British winners since this event became a major. 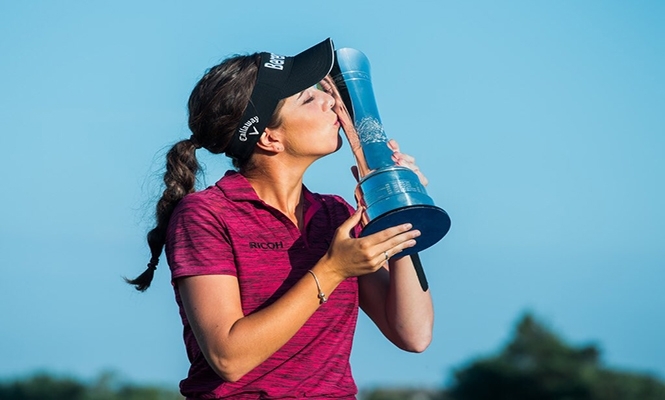 It also secured the Bournemouth-based golfer a life-changing €429,000 top prize, with Hall admitting she had previously missed majors because of the cost. Trailing Pornanong Phatlum by a shot overnight, Hall moved clear of the Thai on Sunday with two holes remaining, and held her nerve on the 18th to secure victory. Hall also says she is just as superstitious as her father and caddie, Wayne, who refused to change his socks for four days. “I am quite superstitious as well, I have to touch every golf club before I tee off to make sure there are 14,” she added.